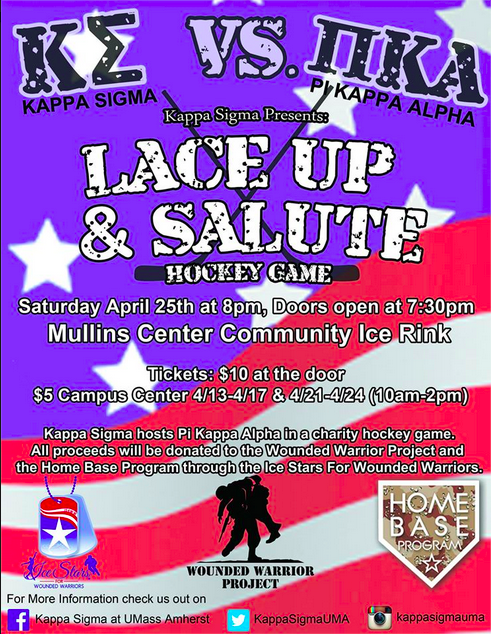 On April 25th at 8pm Kappa Sigma will be facing Pi Kappa Alpha in a charity hockey game at the Mullins Center Community Rink. Both fraternities are excited for the opportunity to raise money for the Wounded Warrior Project and the Home Base Program through Ice Stars for Wounded Warriors. Tickets can be purchased at the door for $10. Tickets will be $5 if purchased beforehand at the location found on the flier below. Help us raise money for these awesome organizations while also enjoying this entertaining game! The mission of Ice Stars for Wounded Warriors is to promote awareness and raise funds for our military men and women who return home suffering from the “Invisible Wounds” of Post-Traumatic Stress and/or Traumatic Brain Injury through a series of fundraisers and community-building events concentrated in western Massachusetts. You can also visit our website at the link below, as well as our Facebook page. Follow us on Twitter and Instagram for more information. 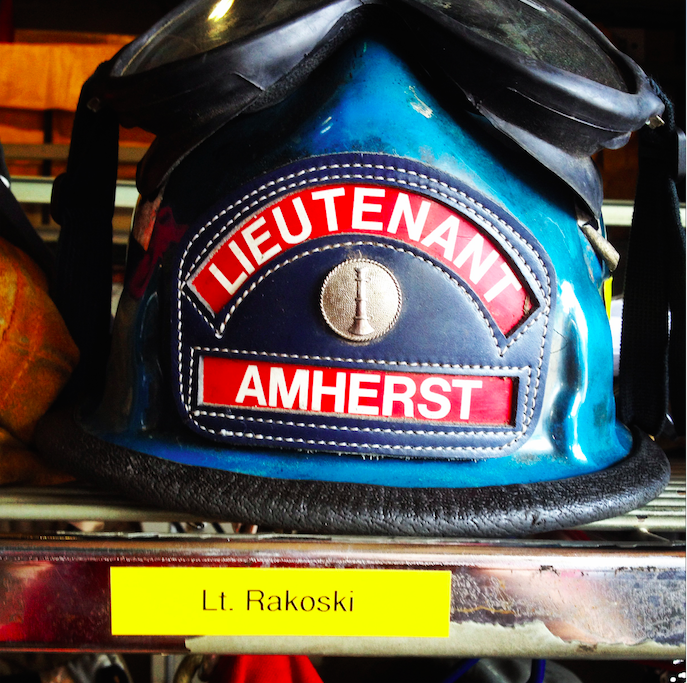 Brothers Rakoski, Purdue, Ward, McQuate and Chisholm all have been working with the Amherst Fire Department through a section comprised of student volunteers. Volunteers in this department are trained in many aspects that allow them to be well prepared for emergencies in the town of Amherst. 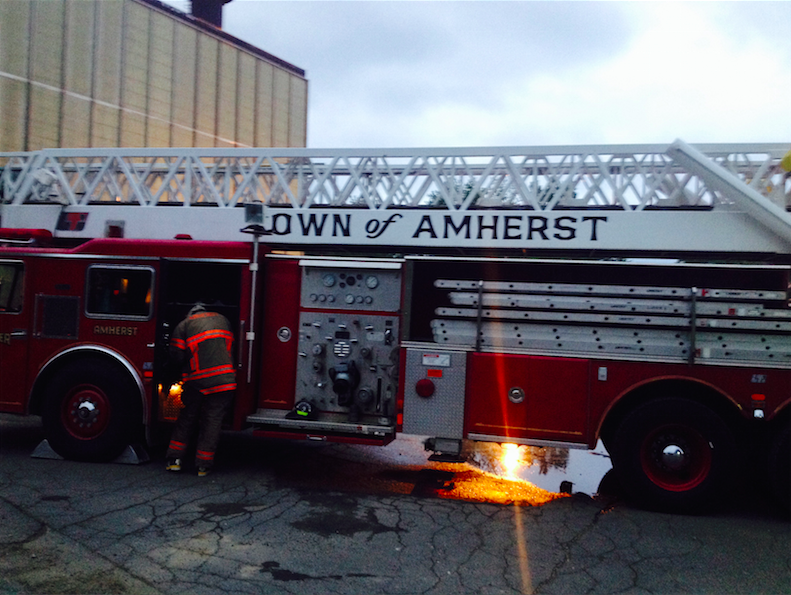 These students respond to all types of emergencies ranging from a cat stuck in a tree to a burning building in downtown Amherst. 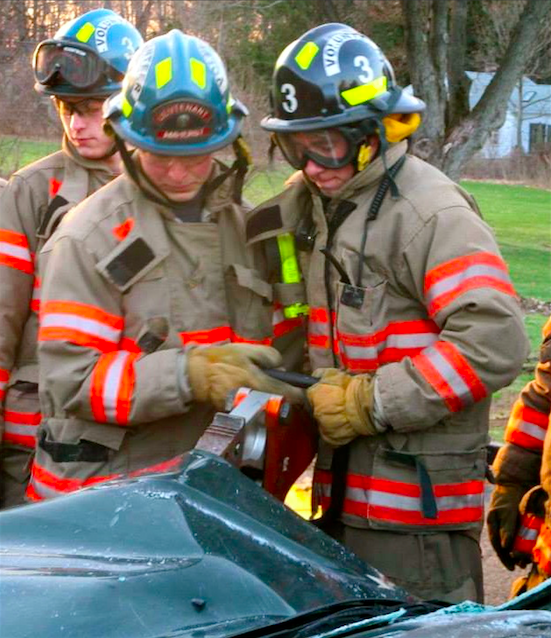 Our brothers must commit to many 24 hour shifts each week and have provided over 2,000 hours of service to the town of Amherst and the University of Massachusetts. Thank you brothers Rakoski, Purdue, Ward, McQuate and Chisholm. On April 5, 2014 we were happy to welcome 11 new brothers into our chapter by initiating them into the Kappa Sigma fraternity. Congratulations to Nick Andrade, Jack Donovan, Matt Fyfe, Wilson Jiang, Nick Lennan, Dylan LoBue, Patricio Lorenzana, Levon Merian, John Pham, Max Scully, and Ari Wigdor! We are so honored to have such an outstanding group of men join our brotherhood. Congratulations to brothers Jake Vitrofsky and Emrah Fejzic on landing impressive internships this summer. Brother Jake Vitrofsky is going to be serving as a contract research image analyst, working for InviCRO, LLC. in Boston, MA. Jake will work with nuclear medical imaging data to run quantitative analyses on a study by study basis in order to meet the needs of the PI that the company is being contracted by. InviCRO is a biomedical research and technology company that specializes in Imaging services and imaging software. Brother Emrah Fejzic will be serving as an intern for a Massachusetts State Senator, pursuing his goal of becoming a successful politician. The brothers of Gamma Delta will always be here for your support. Congratulations Jake and Emrah on obtaining such amazing opportunities this summer! Huge thank you to all of our participants this weekend at Lace Up & Salute 2019! We were collectively able to raise $2800 in support of the @kappasigmahq Military Heroes Campaign. Congratulations to our tournament winners, and thank you to everyone who came out to support! Umass Kappa Sigma Blog at WordPress.com.